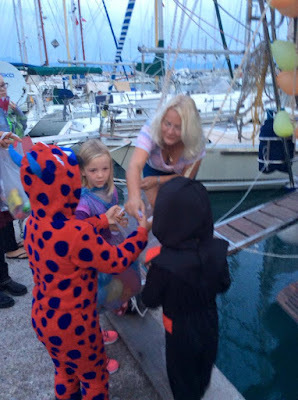 In the weeks prior to Halloween the girls invited some of the local kids to come to our party and I wrangled up some cruisers to participate in the trick-or-treating. In total we had 8 kids participating. 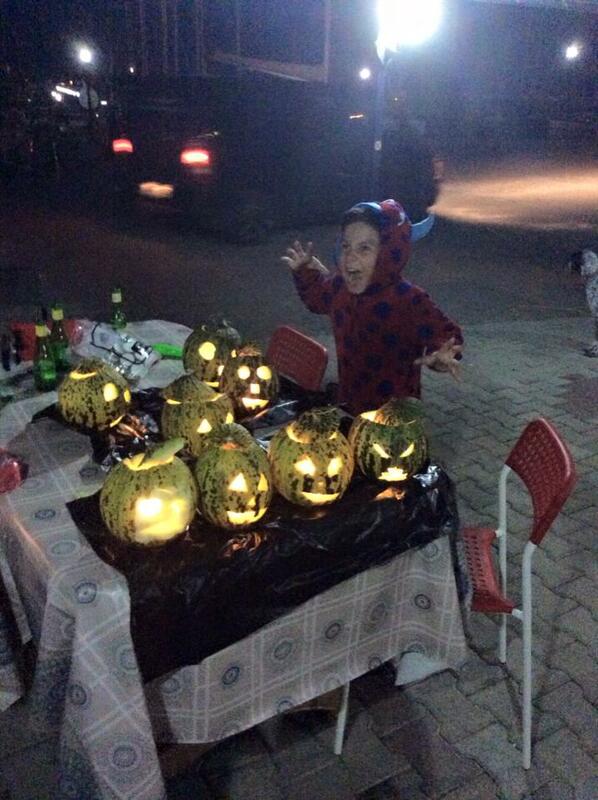 We had to explain to the turkish families what Halloween was and how we celebrated. I asked if any of them had dress up clothes to send the kids with so that they would have costumes. We looked for pumpkins and found some but they were already cut up as the turks use them for cooking. So we decided to try one of the green and yellow melons. We brought it at the Saturday market (the week before Halloween) and brought it home for practice. It worked beautifully (easier to clean and more manageable to carve) so Shaun suggested we throw it in the freezer to preserve it for the following Saturdays festivities and to show the kids what a jack-o-lantern is. During the week before Halloween, I started to purchase treats to deliver to the participating boats. At this point I only knew the quantity of kids (8) and approximate number of boats (which was 4 including us). As the number of boats increased I would buy more treats. The day before Halloween we met a Norwegian family that came into Finike to check it out (they may choose to come back to Finike for a couple of months). 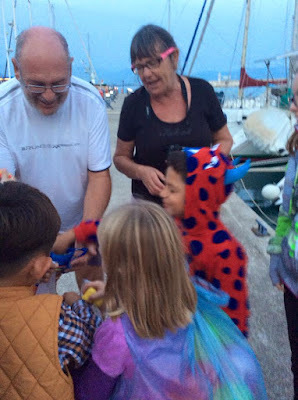 We had dinner with them the same night they arrived and invited them to our Halloween party the following day which brought the kid number up to 10. As Halloween happened to fall on a Saturday we visited the Saturday market to pick up our weekly produce. Before the market I was up early to start blowing up balloons for Jordan's costume as she was going to be a bag of jellybeans. I even managed a quick Skype call into my former book clubs gathering in Canada. We met Christer, Jenna, Ingrid and Edward (the Norwegian family) at the market before heading back. We stopped at the melon truck on the way back as it was closer to the boat (less distance to lug). We were able to buy 4 melons to carry back (we needed 10 but were unable to lug that many). We certainly got our arm work out. The melon carving was to begin at 4:00 PM so I started taking all the paraphernalia for carving melons over to the porthole (our local marina hangout). Paige had printed off a bunch of Halloween colouring sheets as well for the in-between carving and trick or treating bits. At 4:00 ish as kids arrived we got started. We found that the sharpie felt was not able to draw on the surface of the melon so Paige suggested the kids draw their faces onto the blank pumpkin colouring sheet we brought. That was a HUGE success. We had them clean out their melons after they had drawn the face on the paper and then the older girls helped carve all the melons. 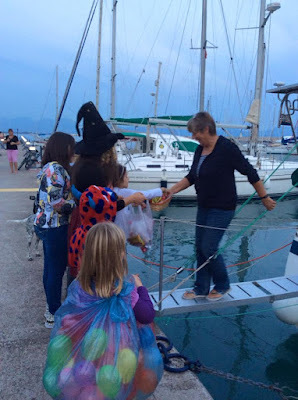 We had to have one of the front office ladies Pinar (one of the kids mom), who speaks english, come over and explain that the kids needed to say trick or treat all together very loudly. We used the marina office as the test. 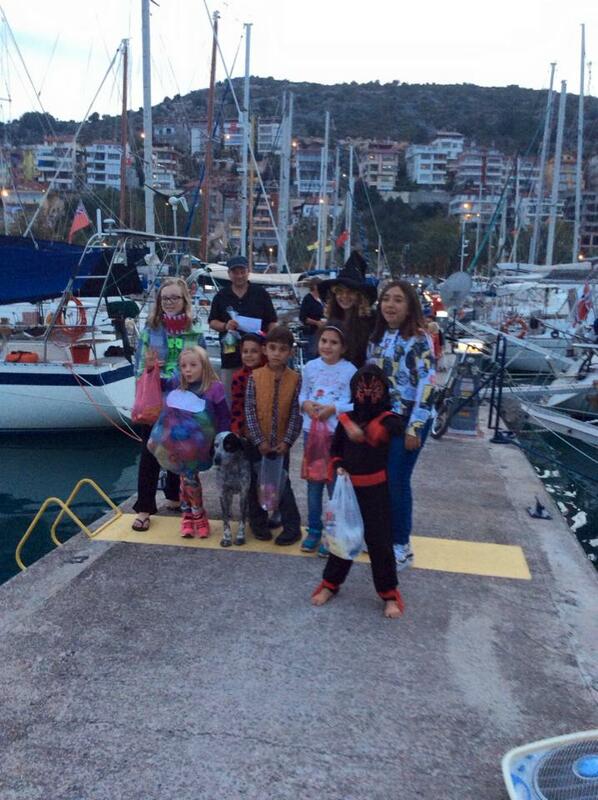 They all headed over and Pinar, her husband and Ziah (the marina manager) all listened to them and then handed out candies. It was so nice that they all got involved. In fact earlier in the day Ziah gave Jordan a witches hat. Sude ended up wearing it in the end. I had also arranged a potluck get together for whomever wanted to join in. I was't entirely sure who was going to show. We ended up having 4-5 cruiser boats appear and bring some wonderful food. We had a great evening. Later on the German family showed up and were saddened by our dismal party.... LOL oh well. Paige and her buddy cuddling up. We left Finike for a 5 day inland trip. Our first stop was going to be Pamukkale. As we were driving along we came across a large herd of goats being herded. Quite the sight to see. On our way thru Denizli we were rear ended. Luckily we are all safe. Our necks and backs are achy but nothing too serious. We were lucky that the drivers nice was with them to help translate a bit. It was quite funny that after we pulled over to exchange information we happened to be in front of a place with photocopying capabilities….. What are the odds? The people that hit us were in na black vehicle and due to the cracked radiator from the accident were unable to run their air conditioning. I went over and offered them one of our waters. The lady came over later and offered up some of her baked goods. Finally the police were called and we were able to get an accident report filled out. 2 hours later we were on our way to our final destination of Pamukkale and Hieropolis. Hierapolis was an ancient city located on hot springs in classical Phrygia in southwestern Anatolia. Its ruins are adjacent to modern Pamukkale in Turkey and currently comprise an archaeological museum designated as a UNESCO World Heritage Site. We arrived and found our hotel. Once we were settled in and had rested we headed over to the base of the travertines to find a place to have dinner. At the bottom there is a large pond that is filled buy the springs. Many duck, geese and sparrows live here. We had promised the girls that after dinner we would let them feed the birds some bread. We drove to the south entrance so that we didn’t have to hike up to the top. My parents have been graciously paying for this road trip including all of our entrance fees. We got through the entrance to find beautiful sprawling fields and hills with the Hieropolis ruins sporadically spread out. To our right there was a hot air balloon floating overhead taking in the beautiful scenery. We decided to walk over to see the white terraces that the hot springs have created. As we approached the ice like terraces we could see paragliders soaring down from their jump off point up the mountain. Paige, Jordan and I took our shoes off and made our way down to the first pool. All of the pools are knee deep and can be waded through carefully. Paige enjoyed the natural clay. We made our way back up and decided we wanted to take a look further over to the right. My mom grabbed a bench as her feet and back get sore. The rest of us headed over. We noticed a flowing stream of water and upon feeling it were pleasantly surprised at the warm temperature. The hot springs of Pamukkale are know to have healing properties with the high mineral content. The terraces wrap all the way around the top. It is quite extraordinary to witness the natural phenomenon. Shaun was reading about Pamukkale on the internet (https://en.wikipedia.org/wiki/Pamukkale) and there are several other locations in the world that have similar phenomena’s. After we made the trek to find the toilets we decided to sit and have a beverage. Of course it is a tourist haven so prices are quadruple. While we were resting my parents decided that in their worldly travels they had seen many Roman theatres and decided that they would wait for us. The girls, Shaun and I walked up the path to the biggest and well preserved (restored) theatre we have seen yet. It was well worth the walk up. Amazing seating areas and views down to the stage below. We could look out and see all the way down to the edge of where the terraces began. On the way back down we had time to see the museum. Well worth the 5 TL for the adults (free for the kids). Earlier in the day Paige and I decided that we would walk down along the terraced pools and meet Shaun, Jordan and my parents at the bottom. It was a fun walk down. We headed for dinner to a Chinese restaurant. The service was EXTREMELY slow as they haven;t figured out how to cook more than 1 dish at a time. That being said the food was excellent. Everyone headed out for dinner but I wasn’t feeling right so I headed back to the hotel and hopped into bed. That night/morning before we left Pamukkale I woke up with terrible diarrhea. I took some imodium as we were traveling by car to Marmaris. We arrived without incident and I went directly to bed. The following day I was still very unwell so Shaun took me up to the hospital for some tests. 2 hours later I was in bed on a strict diet of rice, bread, tea, juice, apples and yogurt along with probiotics and an intestinal antiseptic pill. While on bed rest Shaun took my mom and dad and showed them around some of our favourite places in Marmaris. I would come down for a few minutes here and there before returning to bed. I was able to chat with Vicki the hotel manager. On our last day in Marmaris Shaun arranged for some of our Netsel Marina friends to come over to our hotel and visit for a bit so that I did't have to stray far. It was so lovely to see familiar faces. We packed our bags, said our goodbyes and headed back to Finike for the last week with my parents before they had to depart. Along the way we stopped in Kas for lunch.